Looking for an epic road trip? 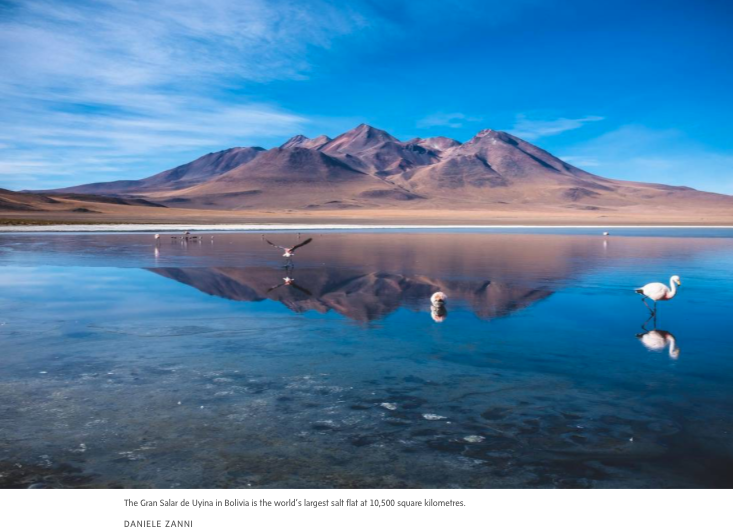 Tim Johnson finds one in the vast salt flats of Bolivia: a three-day adventure where every kilometre covered is 3,600 metres above sea level. If there’s a horizon line ahead, I don’t see it. Every time I think I have it spotted, the line slinks away, disappearing into an indistinct blur, where blue sky meets brilliant white. Coasting over this vast sea, I feel utterly adrift, floating in a place where an oasis just might be a mirage, where hot summer is somehow winter, and where, wrapped in the ugliest pair of sunglasses I’ve ever purchased, I can’t quite believe my eyes. I’m riding in a big four-wheel-drive Jeep rolling through the Salar de Uyuni – the world’s largest salt flat. Set at a high elevation in southwest Bolivia, it’s either a wasteland or a place of amazing beauty – depending on your perspective. From a trickle of tourists, this unique place is welcoming more and more, with record growth in Bolivian tourism recorded last year. Covering some 10,500 square kilometres, the flat is also indescribably vast, but for me, it’s really only the beginning, a starting point for a three-day road trip that will take me across 1,930 kilometres, every one of them we drive, above 3,567 metres. It all begins on the outskirts of Uyuni, a sort of frontier town on the edge of this desert, where I learn a lot about salt. Joined by a small group of fellow travellers, we press through a market packed with people provisioning for similar treks into the flats and arrive at a low-slung building, which, our guide Juan-Carlos Nunez tells us, processes as much as 5,000 kilograms of salt every day. Brought in damp, it’s dried, 150 kilos at a time, piled together into what looks like a giant snow drift, then mixed with iodine and sealed by fire. We try a little, on the fingertip – not surprisingly, it tastes salty. From there, we leave civilization behind, launching deep into the flat, Enrique Iglesias crooning “si pudiera ser tu heroe,” part of a playlist selected by our gregarious driver, Fernando. Always flashing his gold-capped smile, Fernando speaks only Spanish, but finds other ways to communicate with his Jeep-full of gringos. Not just a driver, he’s also DJ, providing a Latin soundtrack for our trip. As he steers us deeper into the salt, the reflection of sun off the endless white begins to hurt my eyes, so I root around in my bag, finding just one pair of shades – a pair I bought as a joke, in part because they reminded me of the glasses worn by eighties professional wrestler (Macho Man) Randy Savage. Soon, “islands” – hills of terra firma – poke up around and ahead of us and, as we near the largest of the bunch, Fernando points over the steering wheel. “Cac-toos!” he says in heavily accented English. Indeed, before us appears a sight straight out of a spaghetti western. Climbing onto Isla Incahuasi (literally, “house of Inca”), Nunez explains that this whole area was once covered by the Pacific Ocean. “This is all coral,” he adds, pointing to the ground. After ascending up a path that winds past dozens of towering cacti, we take in 360-degree views of the surrounding sea of salt, soon rolling again into it, stopping at a randomly selected spot for lunch. Popping out plastic containers of cold chicken, someone quips, “Anyone need some salt?” – receiving just a ripple of tepid laughter. After filling up plates from the back of the Jeep’s tailgate, we pull out props for the requisite photo op. With nothing to provide perspective, camera lenses (as with human eyes) are easily tricked. So a small bottle of whisky, or a toy dinosaur can tower above fully grown adults when strategically placed. We snap photo after photo, crunching across the salt. Nunez is patiently lying prone to get the best angles, us leaning on the whisky – and menaced by the T. Rex – then forming a long line, each of us appearing inside the open triangle formed by legs of the person in front of them. But after a night spent in a guest house built with blocks of – you guessed it – salt, we leave the white behind. Climbing even higher, we ascend further into the Bolivian Andes, presented with a high alpine landscape that’s different from the day before. Making our way above 4,800 metres, Fernando cranking the heat as the temperature drops, and he pumps the tunes, too, blasting out Baila Morenaby Italian artist Zucchero Fornaciari, with the praying Virgin Mary emblazoned on our back hatch seeming to enjoy the music as much as we do. Up here, things trick the mind, as well as the eyes. To our right, the cone of the Ollague volcano puffs little clouds of smoke into the blue sky. Later, heeding Nunez’s guidance to search the sun-scorched landscape for wildlife, we spot a rare vicuna, lone and endangered, hunted for its fur which, when sewn into a coat, can fetch $5,000 at market. And then, perhaps the strangest sight of all, at Laguna Colorada. At first, they’re just a series of bright dots, but soon they take shape, and we see a great array of flamingos. The only thing: They’re not moving. As we bundle up and climb out, walking the shores of the lake, we see why – its waters are frozen, trapping the long legs of these great, pink birds. “They will have to wait until afternoon, when things warm up, to free themselves,” Nunez says, and I can’t quite believe it’s true. The rest of the day, and the next, are filled with more head-scratching natural wonders, snow-capped peaks and Arbol de Piedra, a forest of stone, and the clear waters of the Polques hot springs, where many of us strip down for a thermal bath. With the daylight fading, we arrive at Sol de Manana, or Morning Sun, the highest point of the trip at almost 5,000 metres. Parking amidst the steam of this geothermal field, we walk into the gloaming, and right into the steam being blasted up through holes and boiling pools from some netherworld, far below. Anywhere else, this would be a major attraction, a place where you can literally touch the superheated processes of the Earth’s continued formation. But here? We’re the only ones in sight. Climbing back into the Jeep, the sun seriously on the wane, I catch just a glint of gold as Fernando, with a half-smile, spins the wheel, turning us back down the mountain, turning up a slow jam as we head into the sunset. The writer was a guest of Intrepid Travel. It did not review or approve this article. 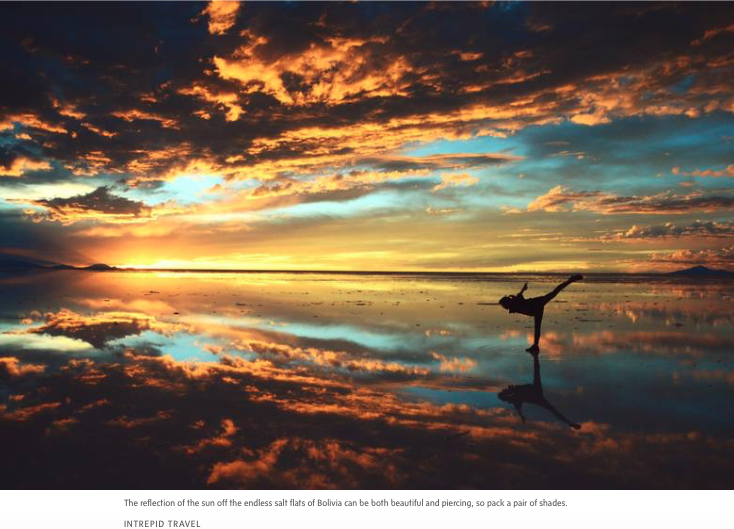 Bolivian Thoughts opinion: Visiting the Salar de Uyuni, both red and green lakes is a must! As there are no other places like them in the world! 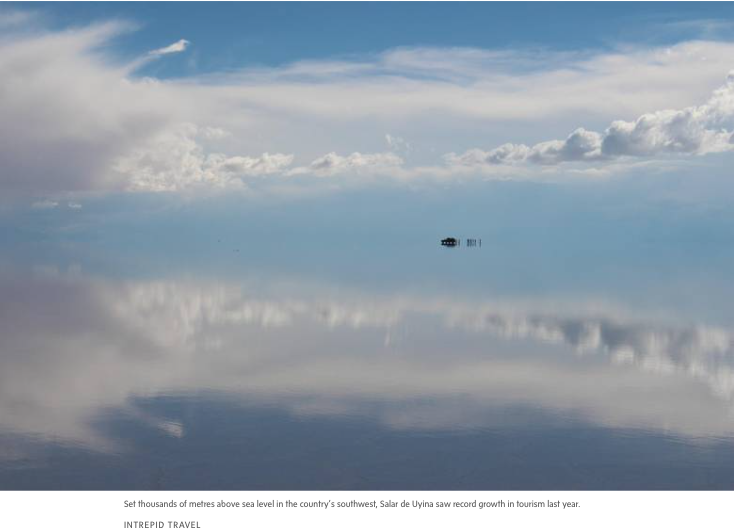 This entry was posted in Bolivia, Environment, Health, Holidays, Potosi, Tourism and tagged high altitude, Salar de Uyuni. Bookmark the permalink.